Up for sale is a wicked cool 1993 R100 GS Paris Dakar. 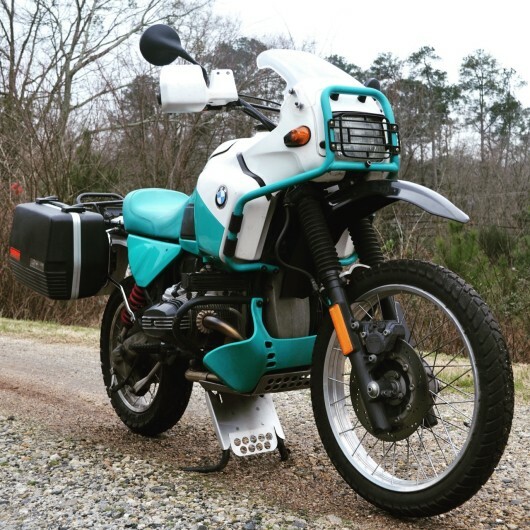 The White/Teal PD paint scheme on this bike screams early 90s Germany. This bike is in very original shape. Features include heated grips, stone guard on the headlight, auxiliary oil cooler, knuckle guards and a perfect set of hard bags and rear rack. The only changes made from stock are the addition of a SuperTrap exhaust and a slightly larger front fender. The original exhaust and fender will accompany the sale along with a spare set of tires. 91,037 miles. Starts easily, runs great and has had a recent service.